"I also have a dog and know how important he is to his family." In a split-second decision, this brave cyclist chose to risk her own safety to save the life of a pet she'd never met. 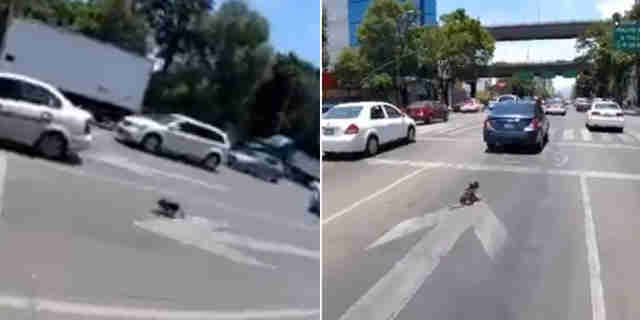 Video uploaded to Twitter by Calaveritabike shows the moment she spotted a small dog get loose and dart into traffic on a busy avenue in Mexico City. Without hesitating, the woman races after him on her bike — putting herself between cars and the pup who, quite miraculously, avoids being struck. The startled dog then continues to run down the road, with the cyclist following close behind until, after two pulse-pounding minutes, the animal is finally able to be corralled. After the clip ends, Calaveritabike says, she then returned the dog to his owner — along with a warning that they should be more careful about securing their pet. The journal El País later caught up with the heroic cyclist to learn what drove her to put her own life on the line to help, and her response couldn't have been more perfect. She said it was a combination of adrenaline and compassion, adding: "I also have a dog and know how important he is to his family."